We are excited to announce the availability of two new features, Virtual Risk Officer and Advanced Reporting. 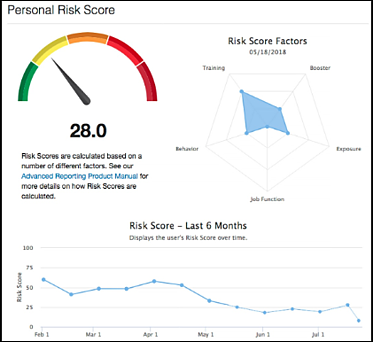 Virtual Risk Officer helps you identify risk at the user, group or organization level that gives you actionable metrics that help drive better decision making for your security awareness plans. Advanced Reporting gives you access to more than 60 built-in reports with insights that give a holistic view of the your entire organization over time. Each report, which formerly took hours to create and are now available immediately, gives visibility into the organization’s security awareness performance based on trainings taken and simulated phishing data.